A Newbery Medalist and a Caldecott Medalist join forces to give an overscheduled princess a day off — and a deliciously wicked crocodile a day on. Princess Cora is sick of boring lessons. She’s sick of running in circles around the dungeon gym. She’s sick, sick, sick of taking three baths a day. And her parents won’t let her have a dog. But when she writes to her fairy godmother for help, she doesn’t expect that help to come in the form of a crocodile—a crocodile who does not behave properly. With perfectly paced dry comedy, children’s book luminaries Laura Amy Schlitz and Brian Floca send Princess Cora on a delightful outdoor adventure — climbing trees! getting dirty! having fun! — while her alter ego wreaks utter havoc inside the castle, obliging one pair of royal helicopter parents to reconsider their ways. Laura Amy Schlitz is the author of the Newbery Medal winner Good Masters! Sweet Ladies! Voices from a Medieval Village, the Newbery Honor Book and New York Times bestseller Splendors and Glooms, the Scott O'Dell Award winner and New York Times bestseller The Hired Girl, the sumptuously illustrated chapter book The Night Fairy, and other critically acclaimed books for young readers. A teacher as well as a writer, Laura Amy Schlitz lives in Maryland. Brian Floca is the author-illustrator of the Caldecott Medal winner Locomotive, the Robert F. Sibert Honor books Moonshot and Lightship, and other picture books, and is the illustrator of many more books for young readers. Brian Floca lives and works in Brooklyn. The Newbery medalist (for “Good Masters! Sweet Ladies!”) Laura Amy Schlitz’s witty writing matches perfectly with the energetic watercolors by Brian Floca, who won the Caldecott Medal for “Locomotive.” I dare you not to laugh at the pink-frocked reptile desperately trying to jump rope. An accomplished storyteller who knows her audience, Schlitz offers an original tale that seamlessly combines reality, magic, and wit. Floca’s expressive pencil, watercolor, and gouache artwork perfectly captures the characters...this early chapter book is beautifully designed for newly independent readers. For younger children, it’s a memorable choice for reading aloud in the home or classroom. Either way, it’s great fun. Legions of schoolchildren will empathize with overscheduled Princess Cora...In illustrations that amplify Schlitz’s wry humor, Caldecott Medalist Floca (Locomotive) produces a reptile that delightfully runs amuck. A mop wig and frilly dress let princess and croc to swap places, allowing Cora much-needed freedom while the crocodile trades insults with the Queen (“Reptile!” “Mammal!”) and gnaws on the fitness-obsessed King (just a little). Utterly charming from start to finish. Schlitz’s narrative is incredibly entertaining, with chapters that alternate between chaos at the castle and Cora’s meandering day in the woods and pastures. Featuring Floca’s hysterical full-color artwork, the book is laugh-out-loud funny...The fable is reminiscent of the finest adult-comeuppance collaborations of Roald Dahl and Quentin Blake, with the added bonus that the princess learns to speak up for herself and the grown-ups learn to listen. Seven spry chapters detail Cora’s much-needed day off and the crocodile’s humorous attempts to impersonate her. Copious ink, watercolor, and gouache illustrations are both delicate in their sensibility (the way princesses often are in classic tales) and witty in their execution (i.e., the crocodile is very poorly disguised). The crocodile's antics are juxtaposed against Cora's pastoral day and enhanced by Floca's ink, watercolor, and gouache illustrations, which superbly amplify the story's emotional arc. All ends happily...A clever tale packed with wry wit and charming illustrations. Floca’s crocodile achieves sly, good-natured ferocity tempered by the delicacy of the ink, watercolor and gouache illustrations, and the humans are just as serious and glum as they should be until Cora asserts her independence. Although divided into chapters, this standout original fairy tale can be devoured in one sitting, making it an excellent overall choice for early readers or a family readaloud. 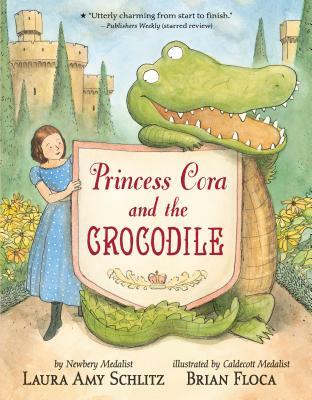 Readers ages 5-10 will cheer when, with the grown-ups humbled, Cora stands up for herself at last and insists on fewer baths, better books, jollier exercise—and, in place of the crocodile, a dog of her own. Hilarious art in Victorian Era style shows the crocodile cross-dress as Cora, carry on in her place (she’s off to play in the dirt) and shake up the parents, all for an important point: Princess or not, it’s worth the struggle to be yourself and make your own choices. A Newbery Medalist (“Good Masters! Sweet Ladies!”) and a Caldecott Medalist (“Locomotive”) team up for a very entertaining feminist fairy tale of a princess who rebels against her overbearing parents in rather novel ways. Readers will find it hard to not love this inappropriate crocodile and his Princess owner. Timely and incisive, this one's a keeper. The Dahl-esque story has a classic feel, and Floca's art blends wit and beauty. A perfect read-aloud — though adults will need a sense of humor. Whether you’re a Cora or a crocodile or a little bit of both, you’re bound to stand in wonder when you see what Schlitz and Floca have come up with together.